THROUGH THE KITCHEN DOOR ~ "Food that bring family & friends together"
During CNY, pork jerky is one of the delicacy that some of us would like to have. But now, pork jerky is getting more and more expensive, every year the price will increased. 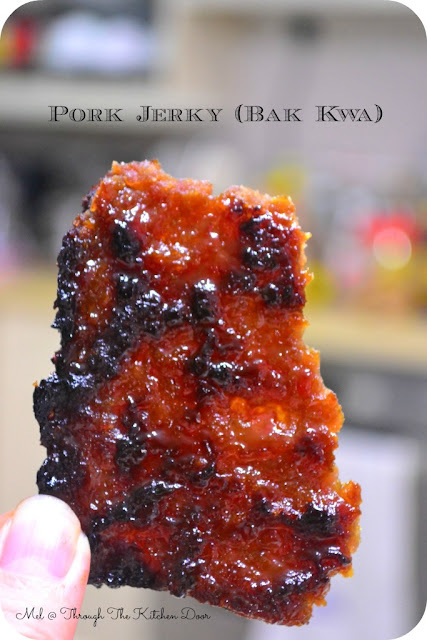 I never knew that we can make pork jerky (or Bak Kwa 肉干) at home. Isn't that great? And moreover what we are going to make at home is the baked and grilled in the oven and not through the BBQ! That is the relieve to me. When I told my Sister S that I am going to make Pork Jerky, the next thought in her mind is, are you going to set fire outside to BBQ it? I am sure if you intend to make this and when you tell it to your family you are going to make it, the next instinct the remarks from them would be "Why go all the trouble.... blah blah and later you have to set the BBQ pit to grill it?" 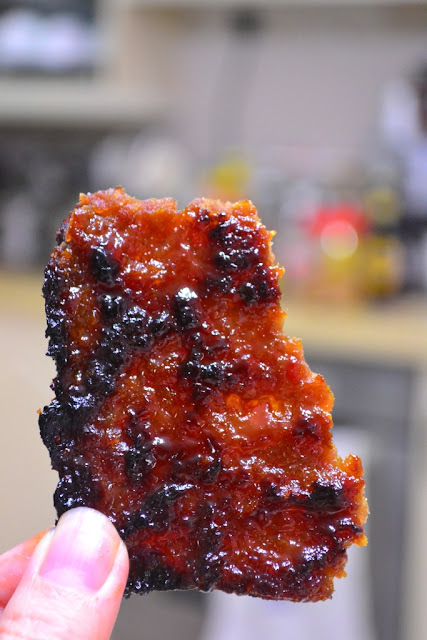 When I saw Sonia of NasiLemakLover made this Pork Jerky last year, I was really amazed that this can be made at home and also lately few bloggers has made it too! 2. Spread the marinated minced pork thinly onto the baking tray (using fingers to spread). cutter, place them in the same baking tray. side, wait oven back to 240C and grill for 7mins or until golden brown with slight burnt. 6. Once done, let it cool and enjoy! **you may store Bak Kwa (at stage 4) in the freezer for later consume. Defrost and grill (stage 5) before serve. It will be even taste perfect if you charcoal grill it. Adjust your oven temperature accordingly, you know your oven better !! * My tray is 12" x 12" so a little thick in slices. My Pork Jerky is a little char and burnt.... I guess 240C grilling for 10 minutes is a little too high temperature and too long for grilling! Will adjust the temperature next time! BUT.....nevertheless of course, ohhhh.....so delicious and yummy! So much like the store bought and without the MSG!! Are you drooling looking at this? Well, I am...........slurppppp !! Oh, you don't like pork? You can try with chicken too! Thank you Sonia once again for this delicious recipe! Hi Mel, Happy new Year to you and family. Gong Xi Fa Cai. Your bak kwa look superb, very professional. Yum yum it look really good. hi mel, i've marinated the meat and will be baking another batch tmrw! yours looking just as good ! Happy chinese new year to you!! Your bak kwa looks great. I am sure it taste even better than the one bought outside. Gong Xi Fa Cai to you and your family. Hi Mel! My daughter loves this so much. My Mum-in-law insists that we buy it from people we know to make sure that it is clean. You make it sound so simple. I will definitely try to to make this. Mel, I am drooling!!! Yours look like store bought. I also want to try later. Gong Xi Fa Cai! Gong Xi Fa Cai and wishing you best of luck, good health, happiness and everything! This recipe works very well for me too and we love it. We will never buy bak kwa again... homemade is good! Ooh.. Just like the real thing! Very drool-licious! 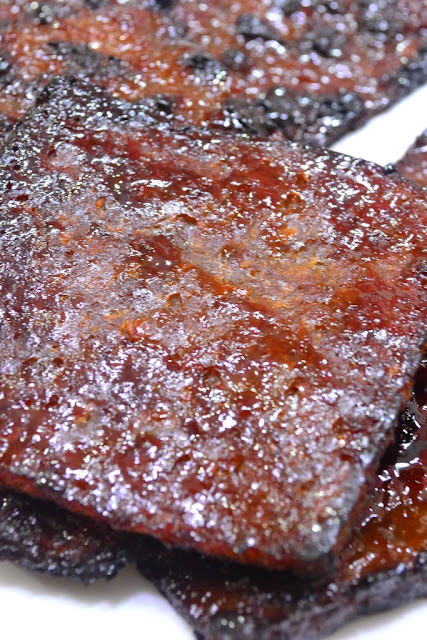 It' interesting to know Bak Kwa is do-able or hime ^^ you did great, Mel! 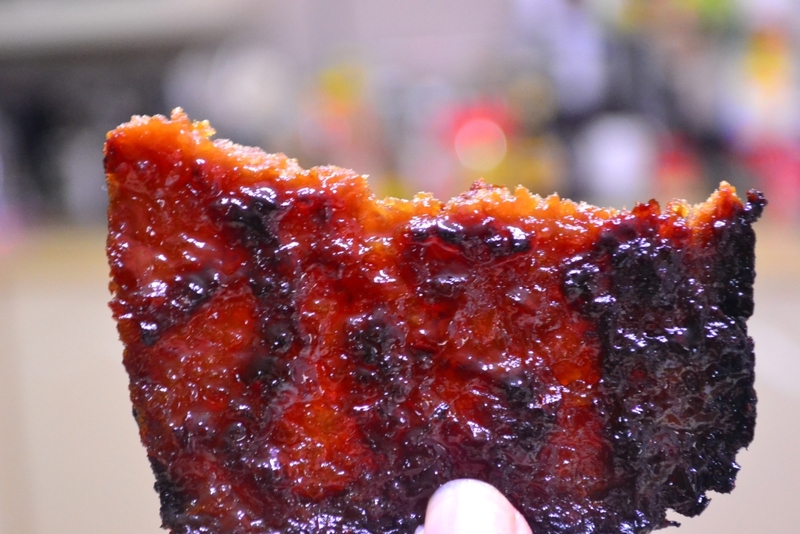 Your bak kwa looks good, I am gonna make my own next year! Hi Mel! Happy Lunar New Year! WIshing you good health and prosperity in the year of the snake! You Bak Kwa looks thick and juicy! BTW, I sent you a snap shot of the packet Gnocchi that I bought from the supermarket. Check your mailbox.. These pork jerky looks ready great! You know, your recipe index or tab has nothing list on it. I love this treat. I see many are making them lately....they are on my to try list but I haven't got a chance to do so as my kids are off from school for a LOOOng weekend. hahaa...Yours looks so good with a little bit charred on the edges. That's how I like it. I made these yummy treats for CNY too and they are the first item to be eaten up! Not surprise at all! Yours looks delicious and some of my relatives actually asked me to grill mine a bit charred! Hi Mel, These are the hi-lite among all the CNY goodies! I made about 3kg, recipe slightly different from yours, and spent several hours on making these bak kwa! A total success! Everything finished in three days, not a piece leftover! I even have a few requests to make more next year! How was your CNY? Hope you had a great one with your family and friends! I love the charred bits! I haven't made bak kwa yet this year, and after seeing your pics, I'm tempted to do so this weekend! I have been wanting to make this but have not yet done so. I will after I finished those given to me for CNY. Your bak kua looks so professional. Good job my dear. Thanks for your shout out Mel..Happy Chap Goh Meh to you . I hear it's very easy to make...but I'm not going to bother as I've so many packets given to me by friends, all stuffed in the fridge and eating them slowly. You name it, I have it! *show-off mode* Hehehehehehe!!! Thanks for dropping by my blog - I've linked you in my blogroll. Do come again...and a Happy Chap Goh Meh to you and your family. P.S. Your bak kua looks really good - like those at the shops, true and true. looks like restaurant made dear.. fabulous..
"Cooking for yourself, your family & friends need not be difficult - get some good ingredients, give yourself the time to get it all ready and the results will be admired and devoured by all. The simplest way to ensure you get a good meal is to buy the ingredients, prepare them yourself and serve them the way you prefer. There is always time to be good to yourself, so nurture your future health with some great home cooking!